Already at the age of 8, he began to study piano, music-theory and composition with the well-known teacher Arthur Schmidt-Elsey in Leipzig, at the age of 12, the clarinet became more important - studies with Hans Berninger, one of the leading clarinet players at the Gewandhaus-Orchestra in Leipzig. 1948: Only 17 years old, his first gig began with a BigBand at the radio station Leipzig, many radio shows and live-concert as a feat. clarinet-soloist took place around Leipzig and Berlin. Around 1950: he moved to West-Germany. 1950 - 1956: He played the lead-alto in the "RIAS-Orchestra". Furthermore, he had his own quartet for radio programms and shows until 1956. As best clarinet player, he was the winner of all "Jazz Polls" in Europe from 1954-1962. 1954: He met Buddy DeFranco in Berlin, DeFranco persuaded him to go to the U.S.A. He met John Hammond (the brother-in-law and mentor of Benny Goodman), who had a keen interest in his work and formed a quartet for him. Performances took place at "Birdland" N.Y., "Blue Note" Chicago, "Newport Jazz Festival" (1957) for instance with John Coltrane, Cannonball Adderley, J.J. Johnson, Chet Baker, Zoot Sims. From 1962 on Charles Mackerras taught him conducting. From 1962-1968 Rolf Kühn became the director of the studio orchestra for TV in Hamburg (NDR). Besides, tours with Friedrich Gulda in Austria and Germany and with the German All Stars a tour to South America for the "Goethe Institut". Played at "Newport-Festival" with Jimmy Garrison, Aldo Romano and Joachim Kühn, recorded an album ("Impressions of New York") for the "impulse"-label with the same personnel. Many recordings for the MPS-label with Albert Mangelsdorff, Daniel Humair, Palle Danielson, N.H.O. Petersen, Randy Brecker, Chick Corea, Joachim Kühn a.o. 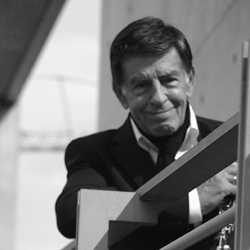 2004: birthday-celebration-tour with Joachim Kühn, new duo-CD "Love Stories"
2009: "Ehrenurkunde 2009 - Preis der deutschen Schallplattenkritik"
release of the biography "Clarinet Bird: Rolf Kühn - Jazzgespräche"
2013: "B.Z.-Kulturpreis" in the category "Jazz"
2014: new release of the biography "Clarinet Bird: Rolf Kühn - Ein Leben mit Jazz"
2016: Rolf Kühn bestowed the Jazz-ECHO for "STEREO". 2018: New Album: "Yellow + Blue"